Christian Wolff is a forensic accountant, who investigates financial embezzlement for numerous businesses, including some dangerous criminal enterprises. As a child, Christian was diagnosed with a high-functioning form of autism, and his father raised him to overcome the hardships of his condition. He arranged for Chris and his brother to receive extensive combat training, including martial arts and sharpshooting. Christian uses those skills to protect himself from the more dangerous elements in his life. Wolff is also being pursued by Raymond King of the Treasury Department, who knows Christian only by the alias “The Accountant”. King blackmails data analyst Marybeth Medina into helping him identify the Accountant. In Christian’s new assignment, he is somewhat befriended by in-house accountant Dana Cummings. When a seemingly safe and normal job threatens the lives of Chris and is new found friend, Wolff ignores his standard protocol and goes after the source of the threat. The Accountant is an entertaining and pertinent new film that highlights the difficulties of mental illness. While the mentally ill are usually victimized or vilified in film, in this case the hero of the story has a form of autism. The strengths of the condition are highlighted, while the character continues to battle the challenges his condition presents. It is really quite fascinating to see the mechanisms that the main character Chris Wolff uses when faced with awkward social situations. So in many ways the film somewhat celebrates the character’s abilities, and in that sense is reminiscent of the movie Rain Man. Of course the movie has to be good in other ways as well, and I found the story line and action sequences to be generally strong and enjoyable. The exception is the part played by the treasury department investigators, which seems somewhat contrived and doesn’t add much if anything to the story. Nonetheless, The Accountant is a solid movie that should appeal to fans of a good crime thriller. The cast includes Ben Affleck, Anna Kendrick, J.K. Simmons, Jon Bernthal, John Lithgow, Jean Smart, Jeffrey Tambor and Jason Davis. The Accountant was directed by Gavin O’Connor, who also helmed Pride and Glory, Warrior, Miracle, and Jane Got a Gun. The movie received mixed reviews, with a Rotten Tomatoes score of 51%. However it saw a largely positive public response, earning an IMDb score of 7.5/10. The Accountant was a success in the cinema, taking in $86.2M at the US box office – almost double its estimated budget. The image quality is strong throughout this film, with strong contrasts and sharp pictures throughout. This presentation is sure to satisfy the cinemaphile, though those with the capability will probably prefer the 4K Ultra HD version of the movie. Check out the details page for The Accountant to see full resolution PNG screen captures taken directly from the disc. The main audio is lossless 7.1 DTS-HD Master Audio with 16-bits resolution at 48 kHz. The disc is a dual layer BD50, with 42.2 GB used and is coded for All Regions. 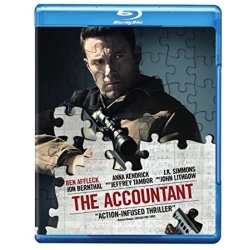 The Blu-ray release for The Accountant comes with just a few supplements, totaling just under a half hour of content. In this behind the scenes segment the cast and crew discuss the main character Christian Wolff. The idea that a high functioning autistic man can use those traits to his advantage is an interesting approach. The film makers researched and studied the reality of the condition to help with the authenticity for the movie. The other key characters also get some coverage in this featurette. This supplement takes an even closer look at Christian Wolff’s condition. While on the one hand people with this condition have difficulty in communicating with others, on the other they can have exceptional intelligence and skills. The Wolff character takes advantage of these strengths and does his best to overcome the challenges. Stunt and weapon consultants for the film discuss the training for the action scenes and fight choreography. The fighting style was chosen to align with Wolff’s characteristics and traits. 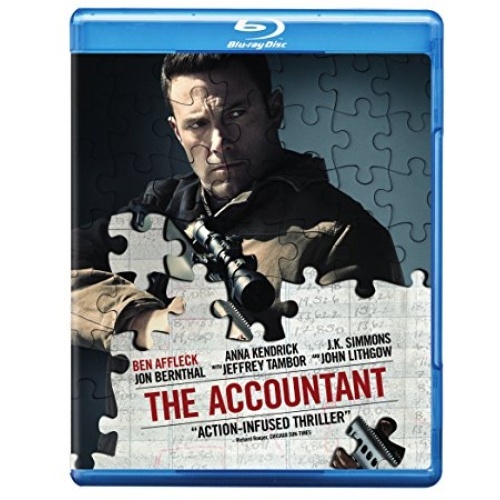 The Accountant is a solid crime thriller that features an unlikely hero with autistic strengths and vulnerabilities. Warner Home Video has put together a strong Blu-ray presentation that includes a half hour or so of supplemental features. Christian Wolff is a math savant with more affinity for numbers than people. Behind the cover of a small-town CPA office, he works as a freelance accountant for some of the world’s most dangerous criminal organizations. With the Treasury Department’s Crime Enment Division, run by Ray King, starting to close in, Christian takes on a legitimate client: a state-of-the-art robotics company where an accounting clerk has discovered a discrepancy involving millions of dollars. But as Christian uncooks the books and gets closer to the truth, it is the body count that starts to rise. This entry was posted on Friday, January 13th, 2017 at 3:23 pm	and is filed under 4K, Action, Blu-ray, Commentary, Crime, Drama, HDR, Thriller, Ultra HD, Warner. You can follow any responses to this entry through the RSS 2.0 feed. You can skip to the end and leave a response. Pinging is currently not allowed.